For the exclusive use by our Servant’s Quarter’s guests, our unique riverside spa is located below the Castle, on the banks of a babbling brook. 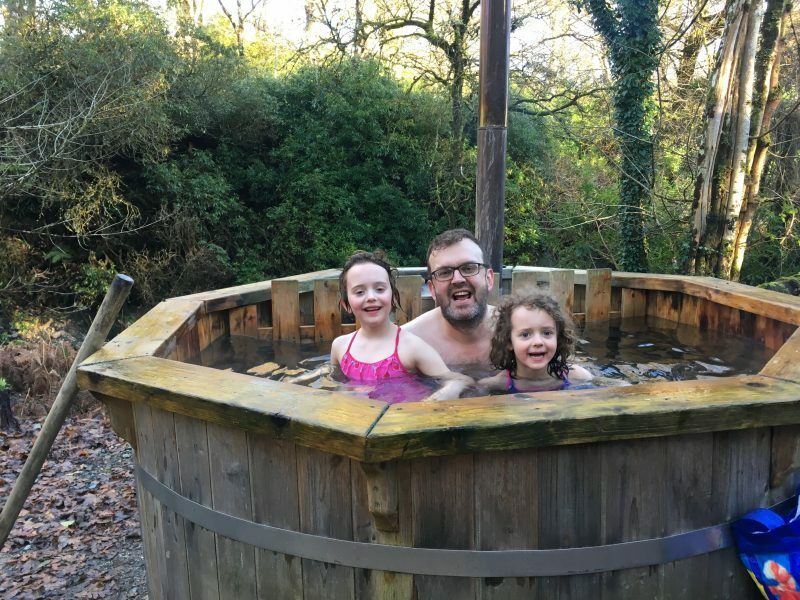 In keeping with our ‘eco’ philosophy, our hot tub is fuelled by wood felled on the estate and freshly filled for every booking with spring water, straight off the hill. It does take a bit of attention to get going but we are always on hand to help. The barrel-style sauna is also heated with a log burner and is ready to go in about half an hour. Brave guests have even used the hot tub as a cool plunge pool while it’s heating up. The hot tub can accommodate up to 6 adults, and the sauna between 4 and 6 (at a squeeze). Our home made changing room and log store offer privacy, and a soon to be built seating area will offer guests the opportunity to kick back, quaff some fizz, and enjoy the tranquility. Because they are wood burning, any vapour and smoke from the flues have the additional benefit of scaring off the local midges, so sit back, gaze at the stars and have fun. On arrival, or soon after, we will provide you with a demonstration of how to fire and operate both the hot tub and the sauna, and then for the duration of your stay it is over to you. Our guests feel this is all part of the fun – so prepare to get your hands dirty! Niall and the kids demo the hot tub!